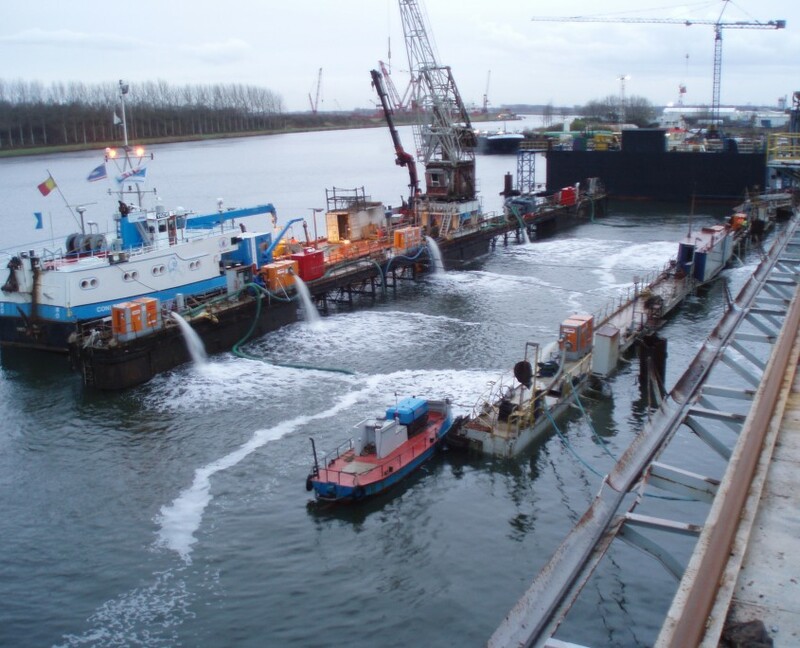 In Sluiskil, DUC Marine Group was contracted to salvage the sunken Dry Dock B of the Schroef shipyard. After being awarded this contract, DUC immediately sent its seaworthy diving vessel and workship “RAM” to the scene. The dock that weighs approximately 1,700 tonnes and measures approximately 96 m x 21.50 m has walls approximately 9 m high. The dock sunk following a technical fault. 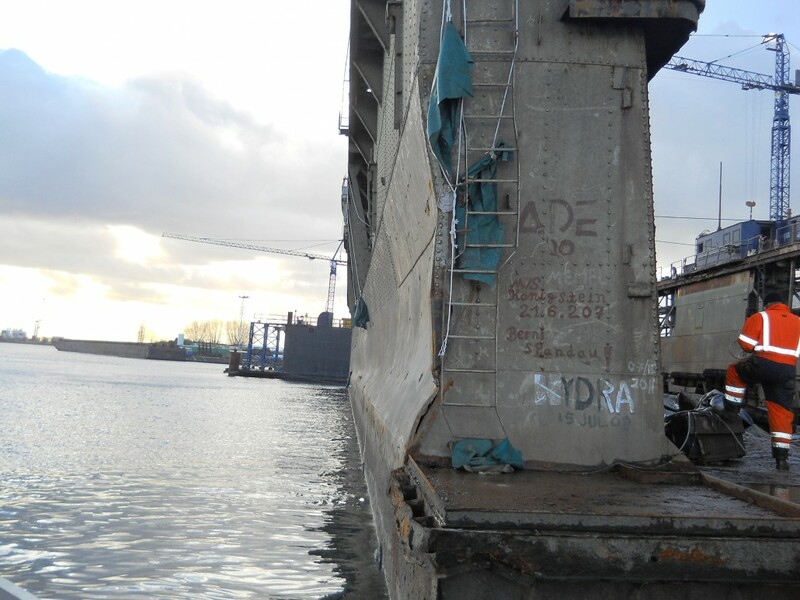 As the dock sunk it listed, which ripped the guides around the guide piles from the sides of the dock. This created two extremely large holes of approximately 6 x 3 m.
The DUC divers cut various holes in the walls to gain access to the side tanks. The holes were repaired from the inside out using steel plates and then sealed using underwater concrete and epoxy. 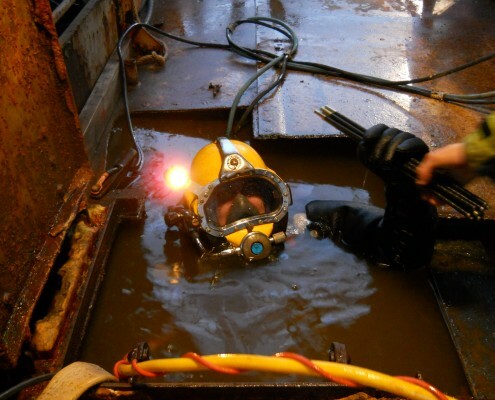 The next step was installing pipes to facilitate the installation and connection of suction hoses. 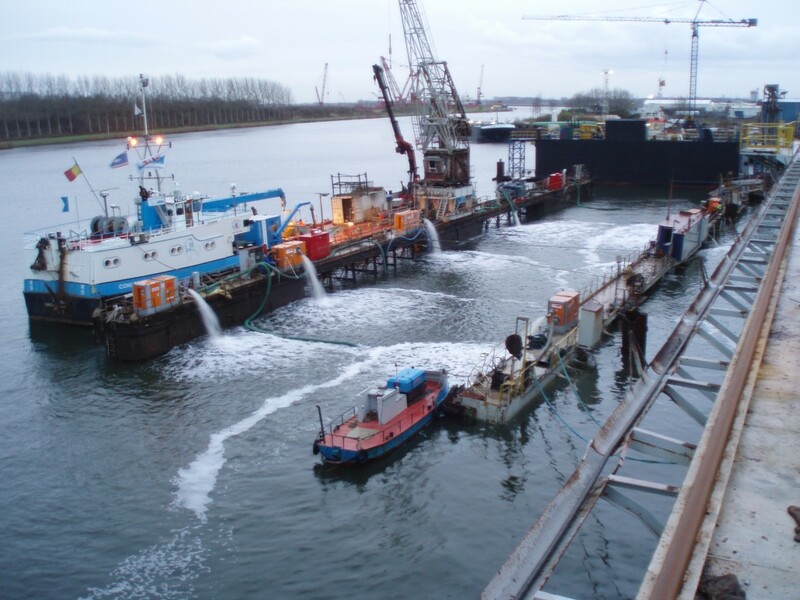 With ten large salvage pumps, the water was then pumped out of the buoyancy tanks to refloat the dock. The adhesion of the bottom of the dock to the bed of the harbour was overcome using chains and air lances. 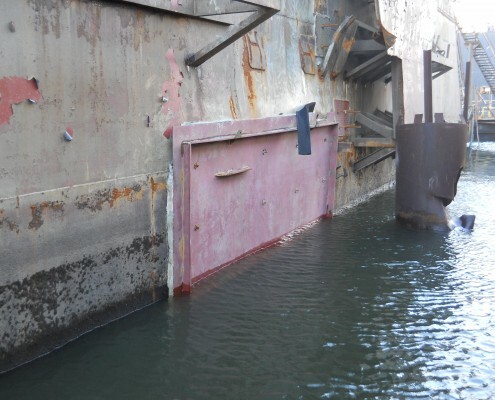 As the dock was raised, the other side wall proved to be in such poor condition that as the water was pumped out, the sides buckled inwards completely and tore. 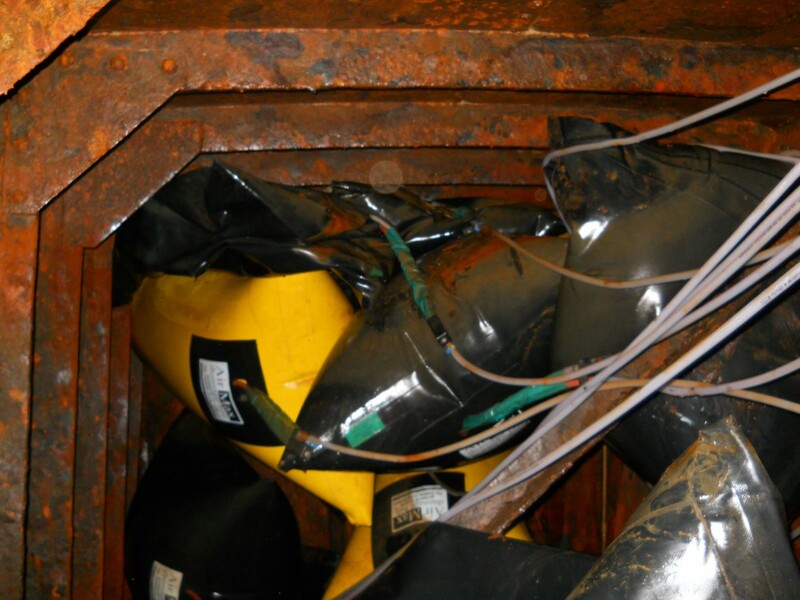 As a preventive measure, the dock was allowed to settle back down and the entire length of the side buoyancy tank was filled with air bags between the frames. 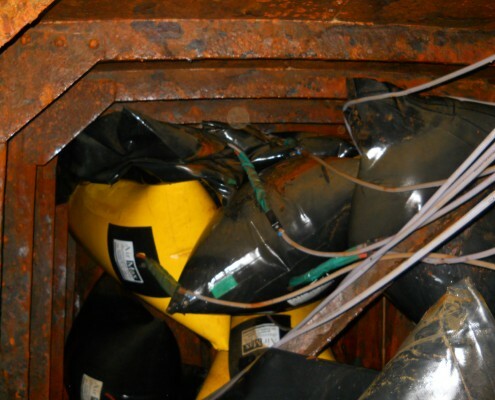 Air compressors and individual hoses were then used to fill all of these bags to provide sufficient support against the water pressure. The dock was then successfully refloated. After being refloated, all of the remaining cracks and holes were repaired, which took two weeks. The salvage pumps were used to keep the dock afloat. The general condition of the dock was so bad that it can no longer be used and had to be demolished in situ. 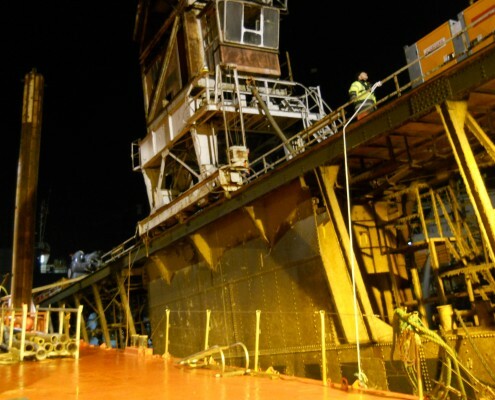 Salvage dry dock!